Well, I didn't drink all the tea in China, but I sure made a start. Our first full day in Beijing we went into a tea shop. 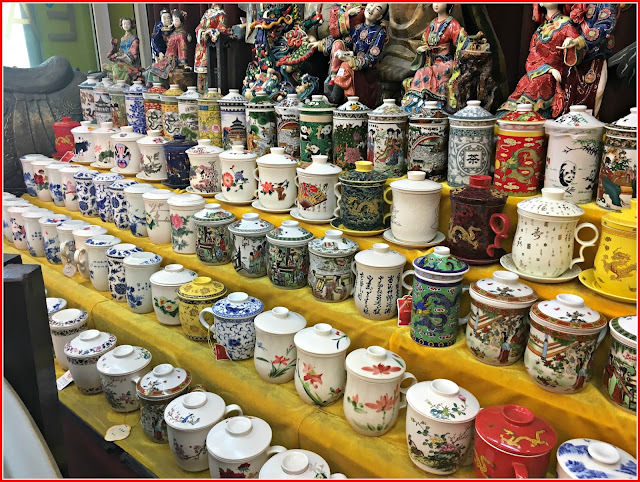 I was thrilled my fellow travelers were willing to spend time poking around, looking at all the tea and cups and pots. It was lovely to smell all the exotic teas. 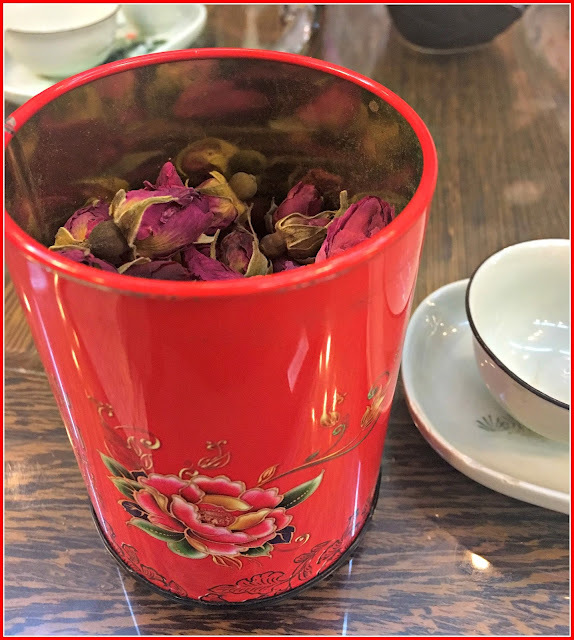 Dried rose bud tea . . .
Lidded tea cups with fitted strainers inside. 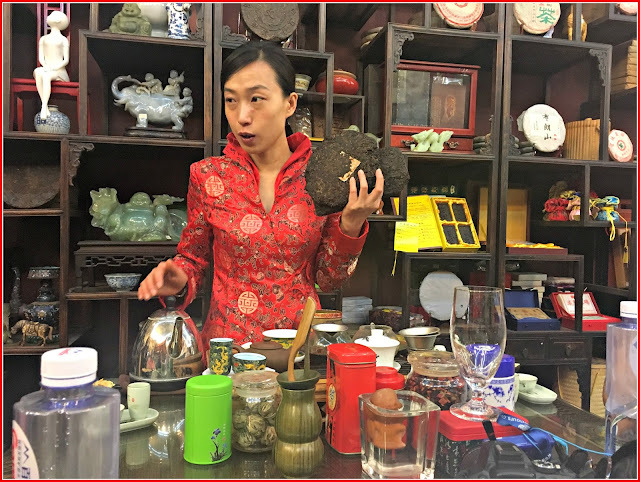 We were given a tea demonstration, and able to try a half dozen different kinds of tea, including a jasmine with ginseng, some peurh tea (a type of fermented tea I had discovered in a tea shop in Boulder, Colorado, earlier this year), a fruit tea, and some oolong. 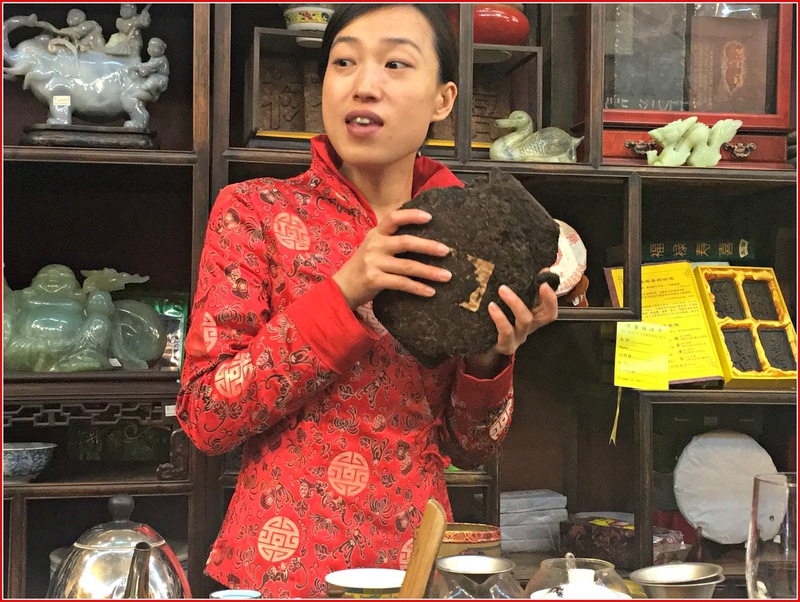 Here, our hostess is holding up a large cake of puerh tea. These teas are similar to fine wines, in that they are dated by age, and the older, the better. Puerh tea is credited with lowering cholesterol, as it contains small amounts of lovastin, a natural statin. Puerh is also supposed to help with digestion, weight loss, and even sleep. Although it contains small amounts of caffeine (but less caffeine the older the tea), it doesn't seem to disrupt sleep because it also contains GABA and theanine, shown to reduce stress and aid in the production of melatonin. I'll be drinking this tea for sure. I really like its earthy taste. We also enjoyed some flowering (or blooming) tea. The bulbs are made by wrapping tea leaves around dried flowers. When you add hot water, the bulb opens, simulating a flower blooming. 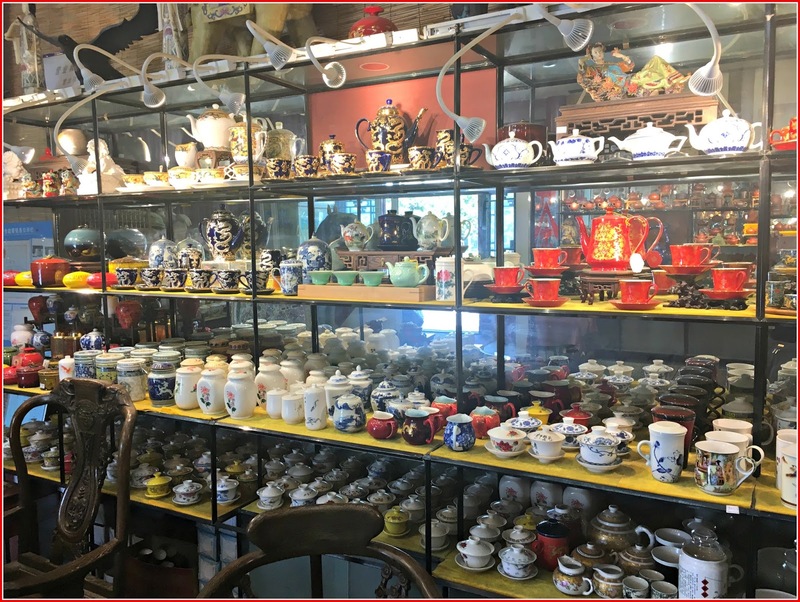 We were told you can get a couple pots out of one bulb, and that Chinese people then leave the opened bulb in the clear glass teapot to display. I bought some of this tea, as well as the jasmine ginseng. I usually think jasmine is too floral, like I'm drinking perfume, but the ginseng seems to cut the too-floral taste. Several in our group loved this "tea," which was just dried fruits. 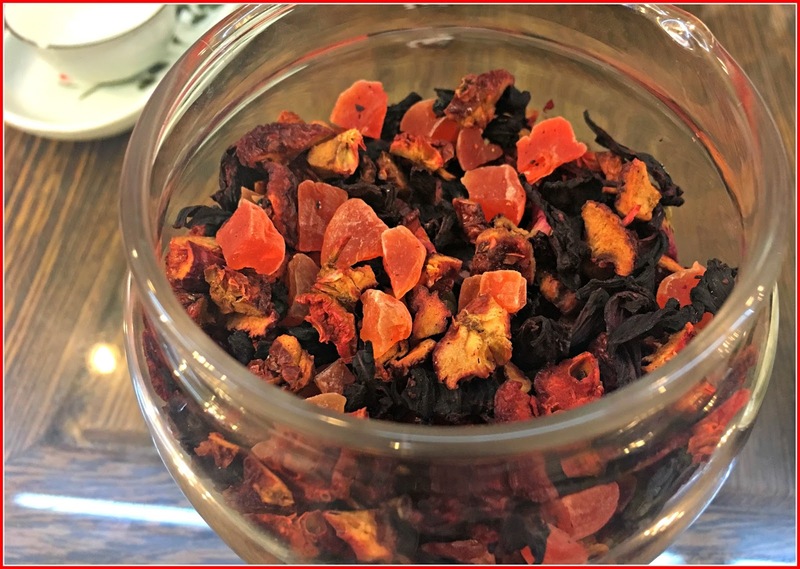 It produces a very rich, fruity tea that reminded me a little of the Celestial Seasonings zinger teas, only more deeply flavored. My husband told me to pick out one of these to take home. I picked a yellow one, very traditionally Chinese. I thought the lid was to keep the tea warm, but you tip it to hold the tea leaves away as you drink the tea. 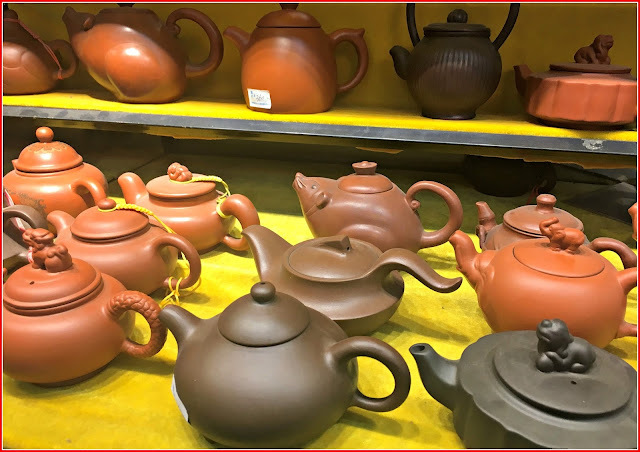 These clay teapots are very popular, and they hold in the heat very well. They also will pick up the flavor of the teas brewed in them over the years, so it is good to dedicate each pot to a different tea. While we were in Shanghai several of us went to a mall to shop for pearls and silk. We went into a little shop selling tea accoutrements, and were served tea by this sweet girl. She served us tea in these cute little cups while we looked around and did the obligatory bargaining. Never pay more than half the starting price, I was told. I learned to bargain by gesturing and punching numbers into a hand calculator! 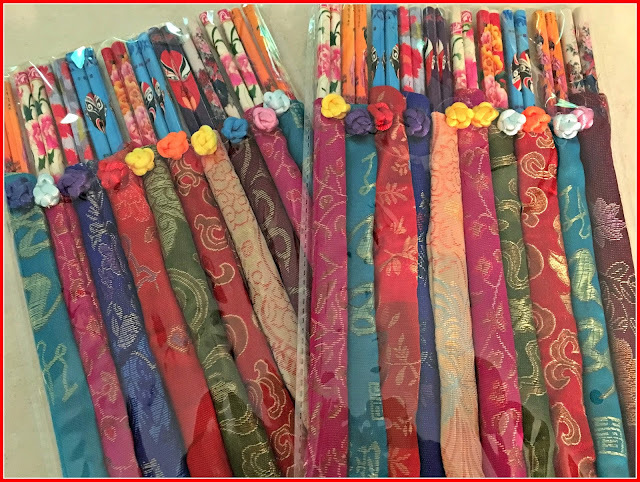 I got a few sets of chopsticks, and then a couple packs of these brightly colored ones. I had this ice tea out of vending machines several times while we were in China. I was happy to see the English on this bottle, as I would not have been exactly sure if it was even tea. 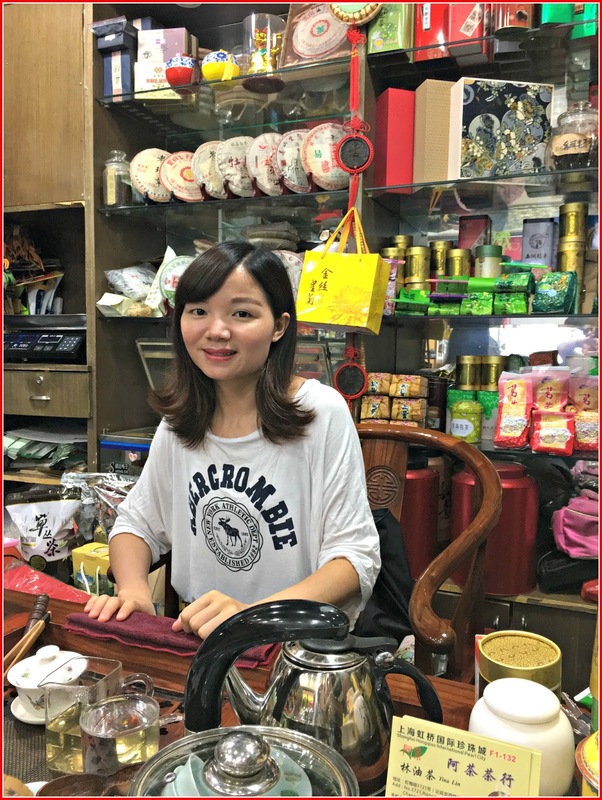 After Shanghai, we took a bullet train down to Guilin, and stayed at a quaint, homey inn where I ordered chrysanthemum tea. You can see the flowers in the pot. In Traditional Chinese medicine, the "chi," or life force, is supposed to be disrupted by ingesting cold food or drinks, but the Chinese sure seem to like ice cream anyway, if the number of Haagen-Dazs shops I saw was any indication. 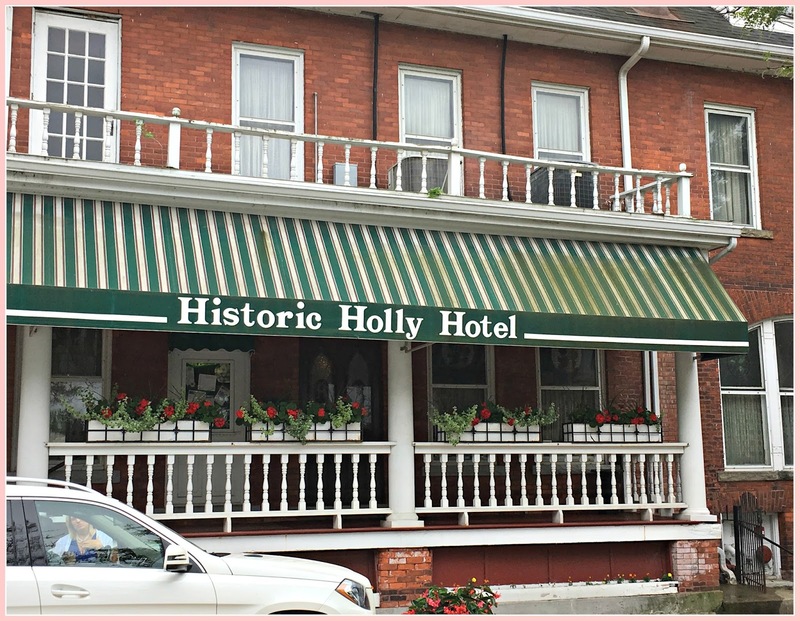 The inn we stayed at offered one or two scoops of ice cream on their menu. I hurt my chi here. This is what they consider two scoops of ice cream. Pretty fancy. I had to dissect how they fixed up this slice of orange. Isn't this clever and beautiful? Peel a slice of orange a little more than halfway down, carefully cut slices into the peel as shown, and then bend the center of the peel back to allow the cut pieces to fan out. 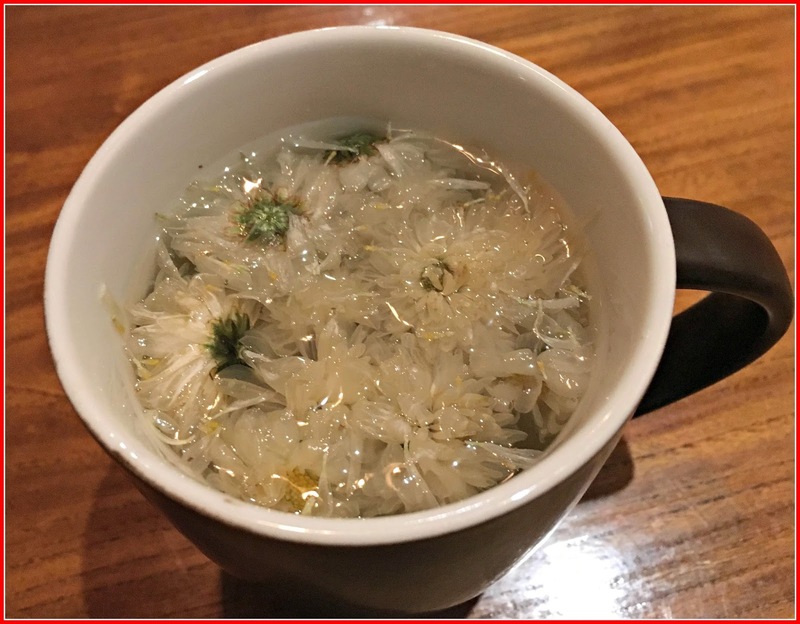 Another evening I got a mug of chrysanthemum tea. Notice all the flower heads floating on top. I have no idea why one night I got a pot, and why I got a mug here. Language barriers. 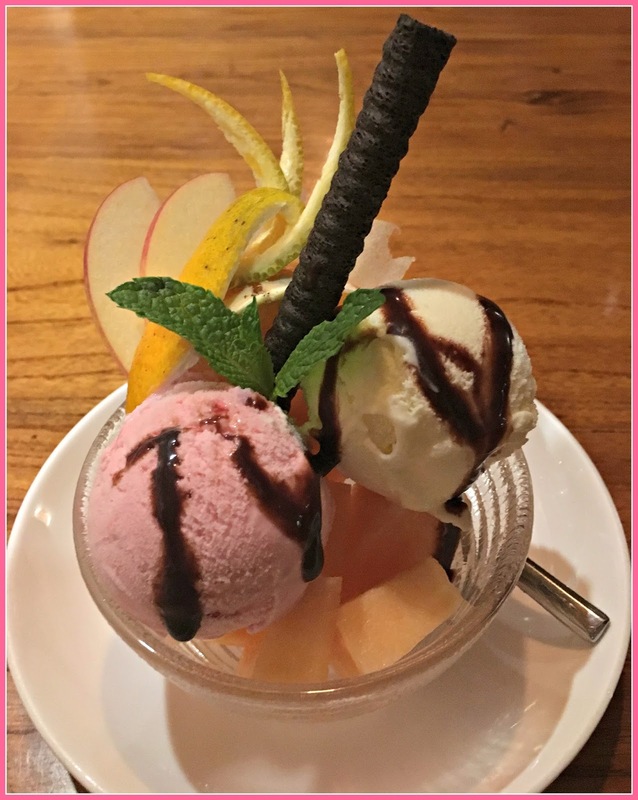 I have another post planned on food in China, and one on shopping, if you'll bear with me. Tea times continue here at home. A friend brought by this pretty dessert for me in honor of my birthday. I'm drinking tea from my Royal Albert June teacup. My husband brought me flowers. I had just got home from getting groceries and couldn't help noticing how pretty everything looked together. On my birthday proper, my daughter took me out for afternoon tea. I had already started in on these when I realized I hadn't got a picture. 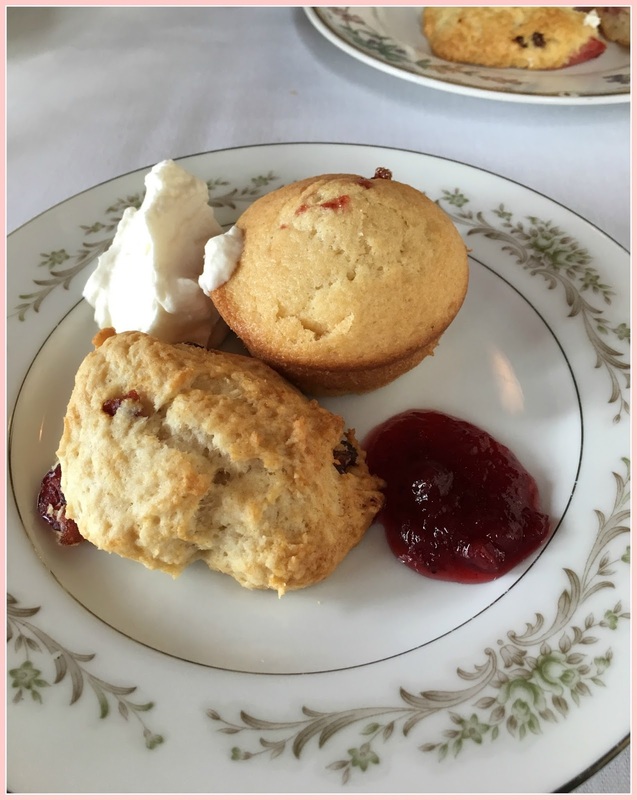 The waitress brought me another muffin and scone just so I could get a picture! Daughter got me a lovely big crystal honey pot and a toast rack. I've always wanted a toast rack, especially after watching all the English period dramas. So elegant. I'm off visiting a friend this week or I'd take a picture of them to share. I did get a picture of this gift from our youngest who just went to England and Scotland. 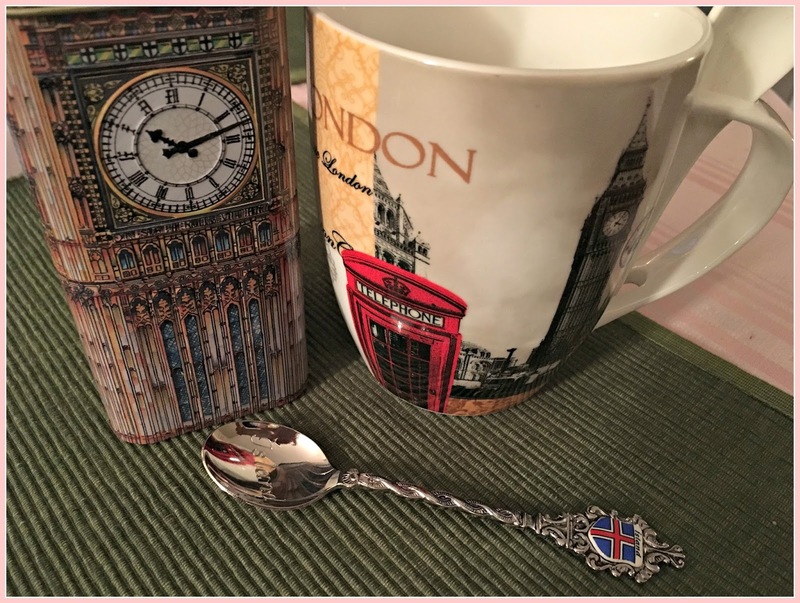 The Big Ben tin contains English Breakfast tea. The spoon is from Iceland, where he stopped for a layover. Mr. Beautiful got me an opal necklace. Happy first day of Summer tomorrow. 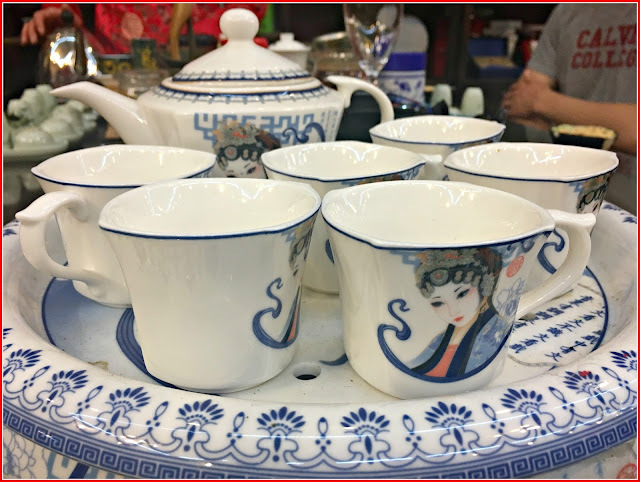 Ohhh, I would never have taken myself for a admirer of Chinese pottery, but there are some beautiful cups and tea pots in those shops. I don't believe that I am adventurous enough to try the wonderful variety of teas. Glad that you did. The blooming teas are very intriguing. I got a grin out of the young lady's shirt...Abercrombie. The first woman's garb was most beautiful. That is a lovely picture of you and your daughter. Sounds as if you were well honored on this "big" birthday. Love your post!Very interesting and beautiful!Congratulations for your birthday! You look like you had so much fun! I absolutely love tea! I would love to try that puerh tea. It sounds good but I have to find out where to buy it. I'm hoping maybe Republic of Tea might have it. Thank you for sharing your tea adventure! Beautiful photo of you and your daughter. 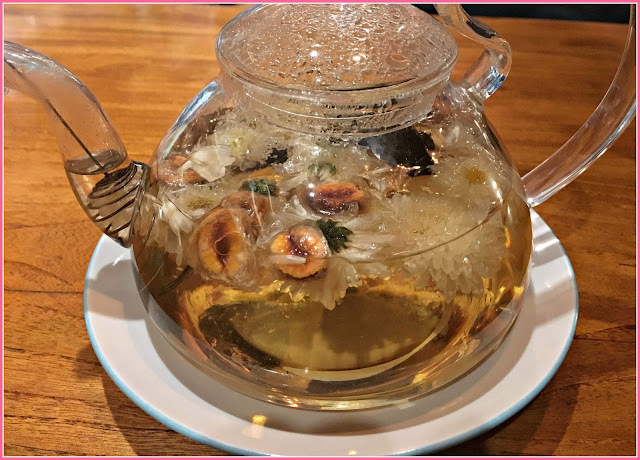 All these lovely teas and dishes are eye candy to me! I love seeing the varieties. Thank you for sharing your wonderful trip. Such loving gifts you received from your family; they obviously know what you adore and appreciate! So many interesting tea treats for the senses at that beautiful and colourful shop in China. Your photos are wonderful. I definitely would have picked up that lidded teacup painted in a single poppy (3rd pic, second row from top), but would have been tempted to purchase a few more presents for people back home. I've enjoyed reading about your trip to China since I will probably never visit this part of the world. It sounds like wonderful trip and then a lovely celebration at home....you look spectacular! 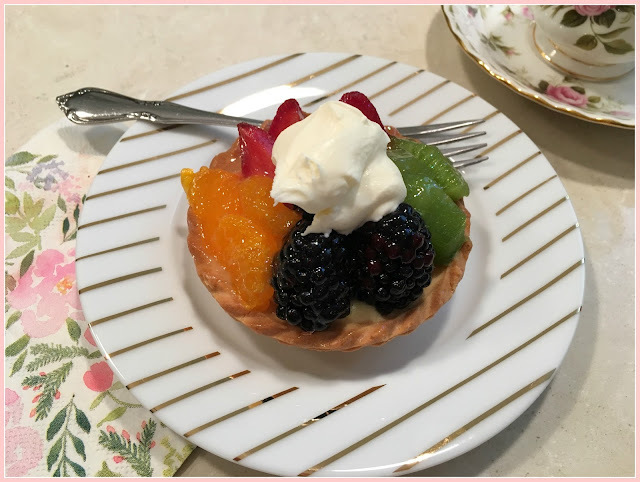 Sounds like you had a wonderful Birthday, I am a great fan of an afternoon tea. 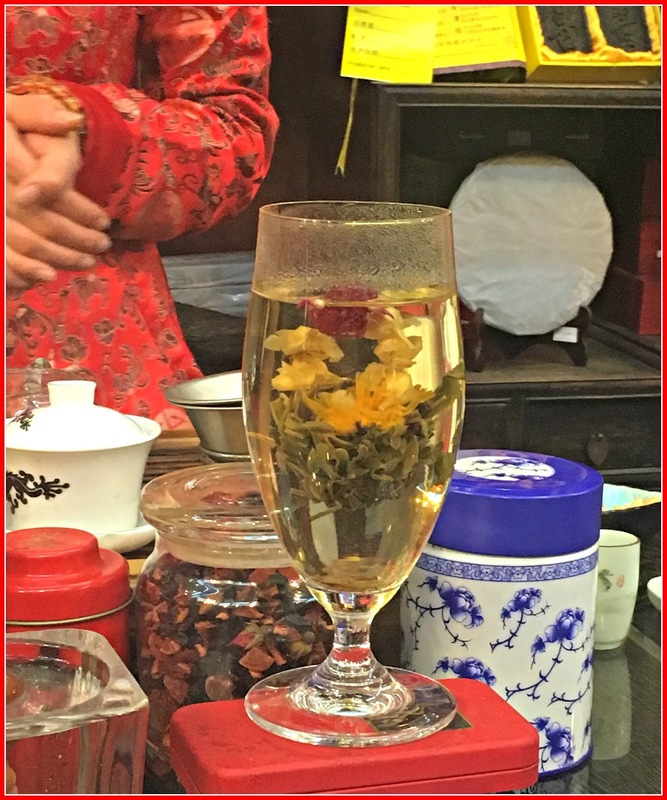 What a joy to see such wonderful teas whilst in China they have some amazing traditions. Deborah, what a delightful post - thanks for sharing all of your China experiences. I really enjoy these. 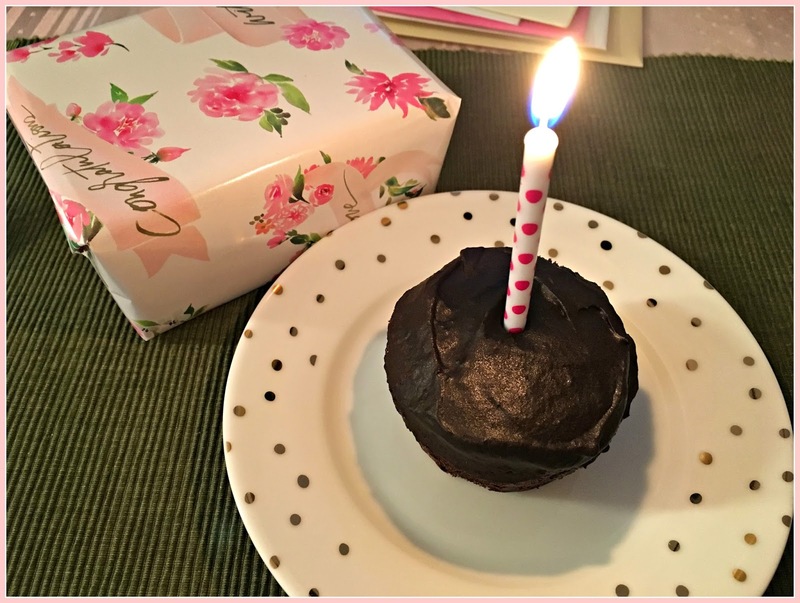 Happy BIG Birthday - mine (also BIG) was this month too. Your kids and husband treated you very well. I so enjoyed seeing all the pretty teacups, teapots, and learning about the different teas. 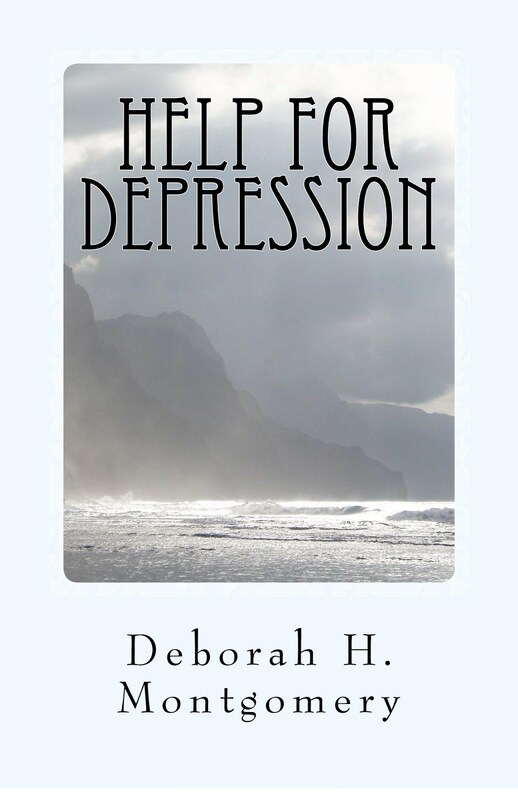 What fun to experience all this, Deborah! Aren't you glad you went? I've had some of those bulb teas. They are pretty to look at, but not exactly my cup of tea, so to speak. 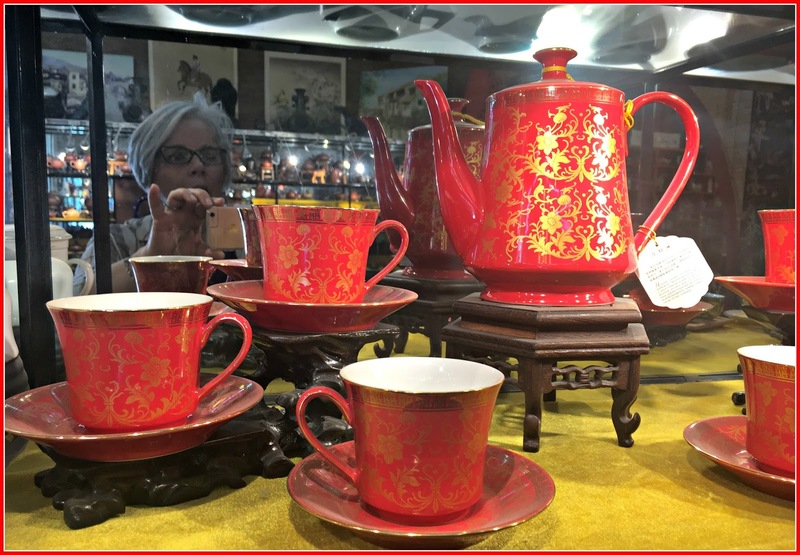 What a wonderful tea adventure you had in Beijing, Deborah! I loved seeing the chrysanthemum tea. . .was it good? When I went to Japan, I had green tea ice-cream every day. Haggen-Dazs was pretty big there, too. But, I have a hard time finding it in the Midwest, unless we go to a Sushi restaurant. 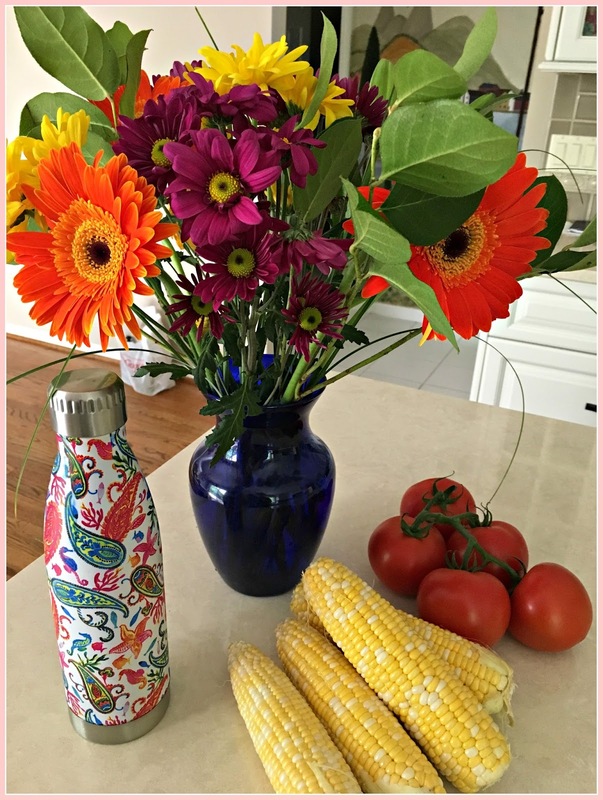 Loved reading about your experiences! I enjoyed your tea tales! It sounds like a wonderful trip. I have a glass teapot with an inset that is where the flower goes, with holes for the flavor to enter the boiling water. It looks really pretty when you use a blossom, otherwise the tea just looks pretty in it by itself. Well, I just was posting a longish comment and my computer went wacko and I lost it...SHOOT! Anyway, Happy Birthday, first of all! The teas, teacups and pots are so lovely...where do you begin to make a choice? You and your daughter look beautiful and the food looked so good. Looking forward to more China posts! Hugs! Happy Summer Deborah! 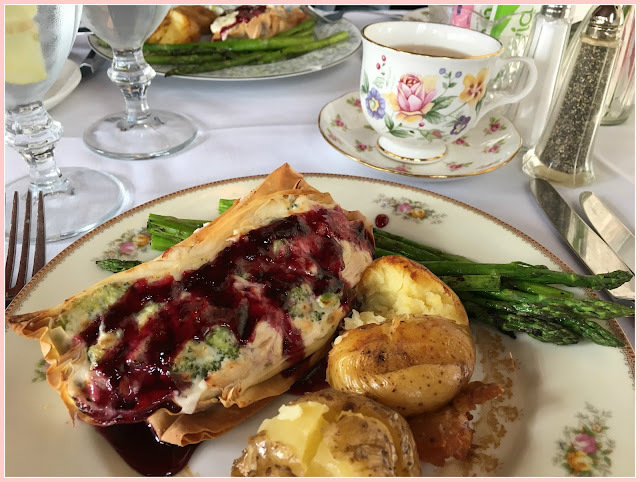 I love this post and your sharing all about the tea you tried-so interesting. I haven't heard of Puerh tea before, but love many healing teas. I am definitely going to find this-I did find it online and will look at some of our stores here. Sending you belated Birthday wishes-may your year be fantastic! 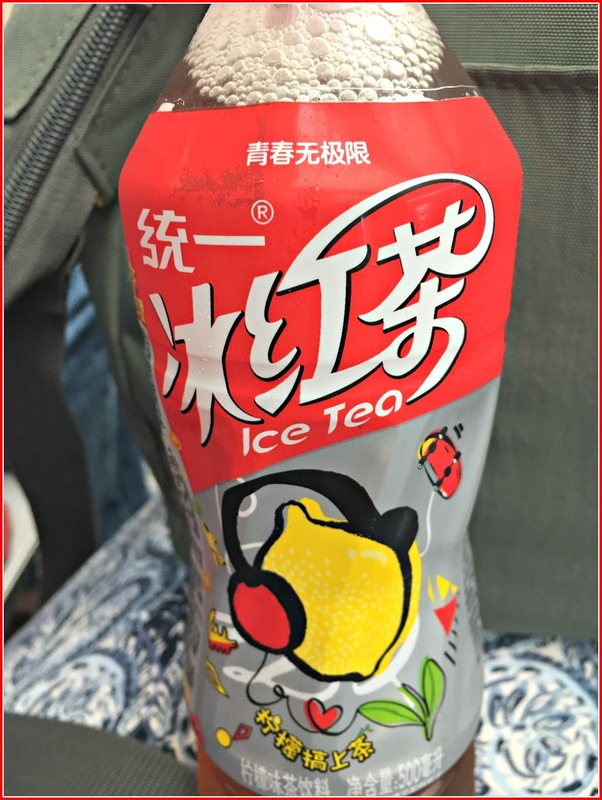 Thank you for sharing your wonderful tea adventure in China. 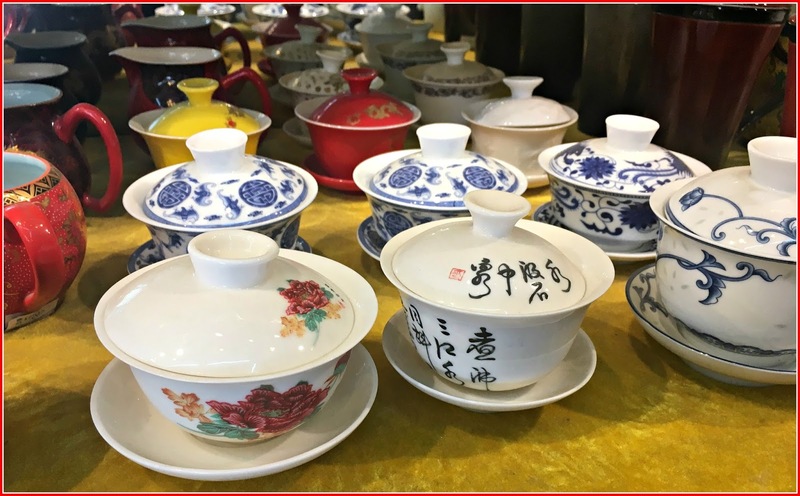 The yellow gaiwan (cup) is the perfect memento from your exotic travels. I've tried puerh at tea festivals. I don't mind the earthy taste, but still prefer the regular black and green teas. The blooming teas would make great centerpieces. Happy Birthday! I'm glad that you were spoiled by your family on your "big" birthday. 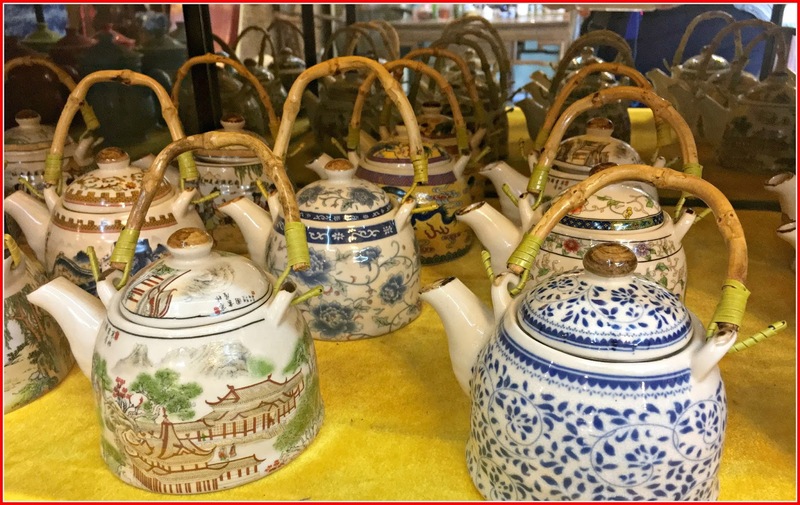 How exciting to see all these tea and related items through your lens Deborah. It's always an adventure trying new foods in a different country but it appears you had no problem. I drink a favoured Puerh tea on occasion and like to try new teas any time. 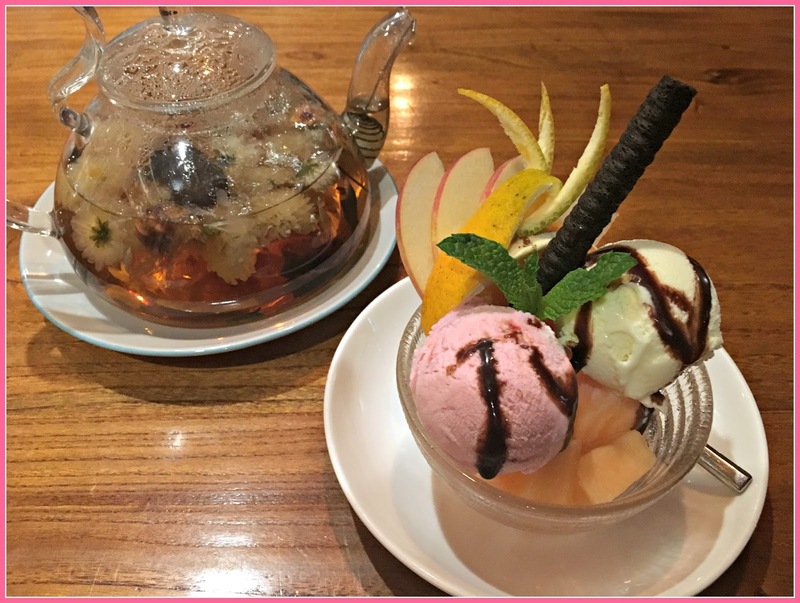 So happy that you got to experience this oriental tea culture. Don't you love their special tea cups and pots? 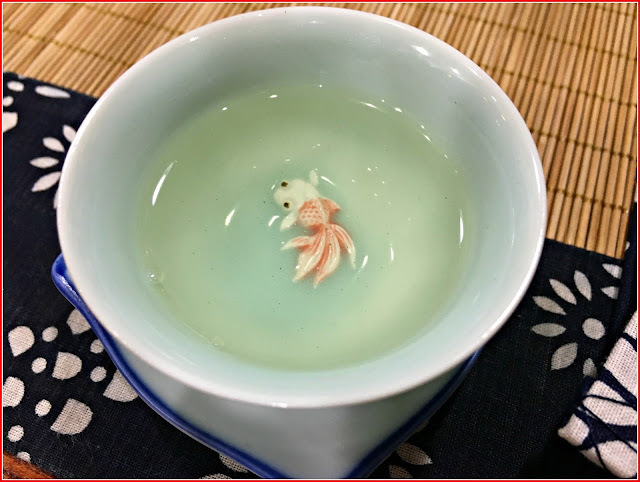 Long ago I've always jasmine tea with my Chinese food but with my CKD I have to be so critical of my sodium intake so we don't dine like that any longer. Love your shoes when you went with your daughter for a tea. Oh Deborah, Your trip to China was amazing! I loved all the teas you tried and also the things that you purchased to bring home! What a great trip! Oh and those tea pots and cups were beautiful! I want to purchase the Puerh tea. Where would I find it? 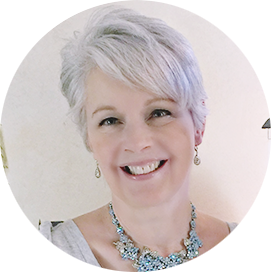 Deborah, I thoroughly enjoyed reading this post. Tea culture is so fascinating. The peurh tea sounds interesting, but looks rather awful! Glad you had a great birthday. I hope your year is filled with loveliness. 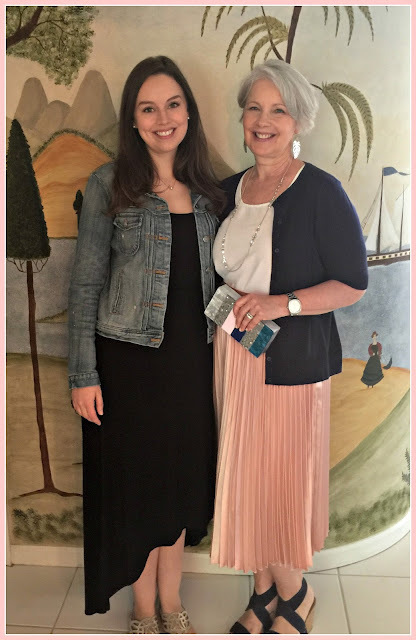 Deborah, this post was so beautiful, I shared on on Facebook and tagged my daughter Anna (who lives in Japan), so she could see it too. I LOVE all the tea things in China -- swooning over here! I used to have a pretty blue cup like the yellow one you got, but sadly I broke the lid :( I love tea things too. I'm trying to figure out what you ate with your daughter. It looks like filo dough with some broccoli in it, with purple jam on top? Please do illuminate me, if you have the time! I'm wondering :) Happy, happy travels. Glad you are home safely. Darling dear Deb- well here I am a whole month late getting - trying- back into reading all I have missed. This post is AMAZING! I would love to hear more about your travels - you documented this one so well! I love all the tea stuff- what a fun time!